Anti-flame and electrostatic charge protection through advanced material and construction. Soft to touch with all over cotton feeling. Features heel and toe reinforcements for enhanced durability. Conform to EN11612 and EN1149 Anti static. 28% ProtexM® (Acrylic), 23% cotton, 23% Wool, 21% Polyamide, 4% Lycra, 1% Belltron. The conditions you work in leave no room for compromises or doubt – especially in terms of potential risks from sparks, heat and flame. That’s why we created a range of anti-flame clothing that combines an outstanding level of protection level of protection with the functionality and on-the-job comfort you expect from Snickers Workwear. The result is a collection that fulfils relevant safety norms and the demands of hard working professionals like you, making every working day a safer, more comfortable experience. Every garment is light to the touch and the material is soft, unlike other anti-flame collections that often feature heavy, uncomfortable treated material. This has not been done at the expense of safety, however. All Snickers Workwear anti-flame garments fulfil the relevant safety standards set out in EN11612. 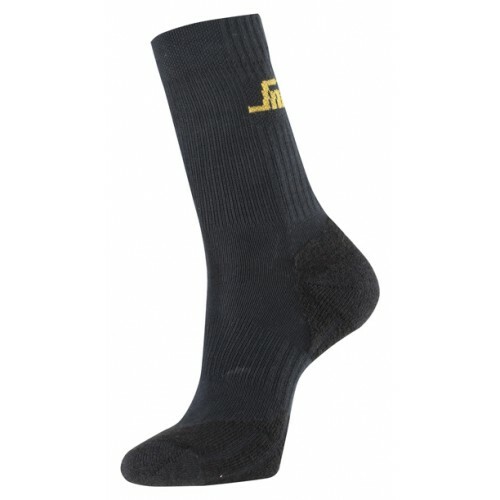 The material used in our anti-flame Sockss and Sockss is specially permeated cotton, designed to protect on contact with flame, convective or radiated heat. Our underwear offers the same level of protection and thanks to the use of advanced material, also delivers outstanding breathability and comfort. It would be easy to design anti-flame clothing that sacrifices comfort for heavy, unwieldy materials – but that wouldn’t be the Snickers Workwear way. Our range is soft, light, cool and features Twisted Leg™ design and pre-bent sleeves – anything for your comfort and freedom of movement. EN 11612 This standard specifies performance for garments made from flexible materials, which are designed to protect the wearer’s body, except the hands, from heat and /or flame. EN 11611 This standard specifies minimum basic safety requirements and test methods for protective clothing including hoods, aprons, sleeves and gaiters that are designed to protect the wearer’s body including head and feet and that are to be worn during welding and allied processes with comparable risks. A1: Indicates that the garments meet the requirements for limited flame spread for surface ignition. A2: Indicates that the garments meet the requirements for limited flame spread for bottom-edge ignition. Class 1: Manual welding techniques with light formation of splatters and drops. Class 2: Manual welding techniques with heavy formation of splatters and drops. EN 1149-5 This European Standard specifies material and design requirements for electrostatic dissipative protective clothing, used as part of a total earthed system, to avoid incendiary discharges. The material shall meet requirements according to EN 1149-1 (Surface resistance) or 1149-3 (Induction charging). The requirements may not be sufficient in oxygen enriched flammable atmospheres. This European Standard is not applicable for protection against mains voltages.